Thursday was our last day at the beach. On Tuesday when we’d been on Shackleford Banks, I’d pointed out Fort Macon, which is the easternmost point of the Crystal Coast and just across Beaufort Inlet from the Banks. To my surprise, Margaret had never been there before and was very interested in visiting, so we got an early start and drove out there Thursday morning. Fort Macon predates the Civil War – in fact, the site has been home to a succession of fortresses dating back to the pre-Revolutionary days. The current, five-sided structure was begun in 1826 and finally garrisoned in 1834. It was captured by North Carolina troops early in the Civil War and remained in Southern hands until it was surrendered to the Union in 1862, after an eleven-hour bombardment from both land and sea. John and I visited Macon last October. It’s one of those places that gives me a very special sense of time and history. Even though the fort was manned by the military during WWII, it seems both steeped and stopped in the Civil War time frame. The fort is constructed of brick and stone, and consists of twenty-six vaulted rooms, or casements, surrounding a parade ground. These rooms are in surrounded by a grassy moat, which is surrounded by a wall more than four feet thick. 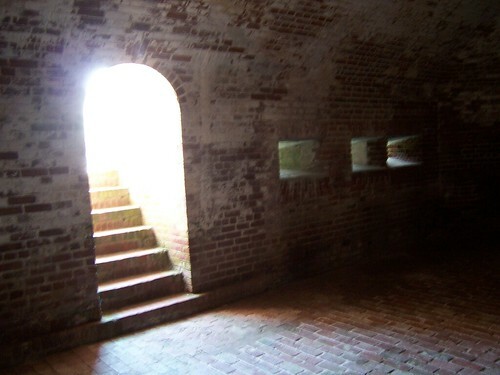 Some of the casements have been nicely restored and outfitted with information and displays that show their use during both the Civil War and WWII; others are used for an office and gift shop; the balance have been left empty, and it’s these empty casements, with their curving lines of brick and echoing shadows, that linger in the memory. They’re not spooky, exactly, but the play of light and dark within the rooms is fascinating. They’re highly soundproof, too; it’s possible to feel quite alone in one of the empty casements, even though other visitors may be tramping the grounds. From the parade ground, you can walk up a steep staircase to the ramparts of the fort, where only a few cannons represent the many that once guarded the Inlet (in the photo, I’m pointing toward Shackleford Banks). The fort was well-equipped to withstand bombardment from the sea; it was only until Union troops managed to invade the Bogue Banks to the west and set up siege guns that the situation at Macon became hopeless. The fort’s commanding officer, Col. Moses J. White (all of 27 years old) was forced to surrender. 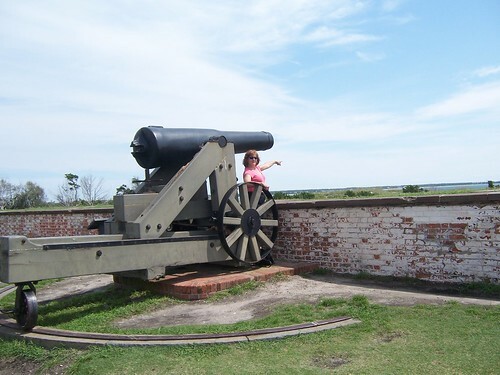 Despite all this, Fort Macon lacks the sense of melancholy that so many Civil War sites have. Perhaps it’s because there was no major loss of life during its battles; perhaps it’s because it’s surrounded by refreshing ocean breezes. In any case, Margaret and I prowled around happily for several hours, then drove into Beaufort for a delicious lunch at a place called the the Beaufort Grocery Company, where we dined on gougeres – little herb pastries filled with chicken, egg or shrimp salad. We split an order of deep-dish apple pie a la mode and then headed back to Emerald Isle, to pack our cars, close up the house, and return to our respective homes.